Dr. JudyLee Oliva is a Chickasaw playwright and is known for her inspirational work, "Te Ata," which captured the legacy of one of Oklahoma’s most intriguing Native storytellers. Dr. Oliva holds an MFA in directing from the University of Oklahoma and a Ph.D. in theater and drama from Northwestern University in Chicago. She is the author of two books and numerous articles pertaining to the theatrical arts. The acclaimed playwright has worked in theater for over 25 years. In the early 1990s, Dr. Oliva came across some long-forgotten files stored in the Western History Collection at the University of Oklahoma documenting the life of Te Ata Fisher (1895-1995). Dr. Oliva initially hoped to gain a better understanding of the connection between the theater arts and American Indian performance. However, this finding sparked the beginning of the playwright’s most notable work, which included ten original plays about the historical Native American storyteller. Dr. Oliva describes the work as a 13-year undertaking of personal growth, appreciation of her Chickasaw heritage and creative inspiration. "It became a personal journey for me," Dr. Oliva said. "[Te Ata's] message was certainly to follow your heart and your dreams." This message definitely carried over into the playwright’s other works. Her play, "On the Showroom Floor," has received critical acclaim and won numerous awards. 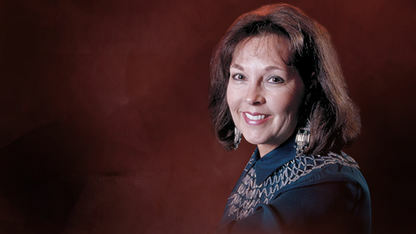 "Being Chickasaw means believing, even when you are not certain that you can do it," Oliva said.